Travelers from families to couples and friends to singles can enjoy more entertainment for less money by reserving Niagara Falls Hotels packages. Featured Falls Avenue Resort properties provide guest rooms close to included tourist sites and restaurants. Explore your options below. Family hotels in Niagara Falls cater to all ages. Check out Skyline Hotel & Waterpark’s Niagara Falls family packages. Your group can stay up to two nights and use up to four passes for year-round splashing thrills. A convenient enclosed walkway connects the hotel and Fallsview Indoor Waterpark. This 3-acre locale features 16 waterslides, Tidal Wave pool, Beach House’s rain fortress and play area, Tiny Tots Splash Park, Horseshoe Hot Springs and outdoor activity pool with sundeck. Enjoy Beach Club food and Beach Bar beverages and cocktails. Your Waterpark Getaway Package also provides early access to this family-friendly destination. Kids love the Skyline Hotel’s bunk bed suites and video games. Parents appreciate moderate rates and popular amenities like refrigerators, coffee makers, Internet access and upgraded bathrooms. Visit on-site Perkins Restaurant & Bakery for any meal or dessert. Bring pillows, blankets and snacks to the indoor tropical courtyard to watch family movies. A covered skywalk takes you to nearby spots from Adventure City to Hershey’s Chocolate World. Ultimate Couples Experience: Sensational food, wine tastings, spa treatments and cocktails for two make this getaway romantic. Niagara Winery Experience: Enjoy several guided winery tours with wine tastings and transportation, three fabulous meals and relaxing spa services. Ultimate Spa Experience: Combine soothing massages with refreshments, three enticing feasts, cocktails and winery tastings. Ultimate Casino Experience: Play at Casino Niagara or Fallsview Casino, eat three marvelous meals, luxuriate in spa indulgences and sip wines. Niagara Culinary Experiences: Gourmets can choose from top wineries’ excellent vintages and celebrity chefs’ appealing specialties. New Year’s Eve Packages: Join any of the multiple celebrations that mix one or two meals and entertainment or parties with majestic waterfall views. Clifton Victoria Inn: From welcome amenities and complimentary services to neighboring entertainment and eateries, this inn is a convenient choice. It offers Jacuzzi suites, upgraded guest bathrooms, a soaring atrium, lounge, whirlpool, swimming pool and sauna. Freebies include buffet breakfasts, Internet, HBO movies, local calls and parking. Casino Niagara is a popular tourist spot close to Clifton Victoria Inn. The stunning falls are a block away. Crowne Plaza: This grand landmark hotel supplies modern amenities and superb service in an upgraded Victorian setting. Guest rooms include Deep Sleeper Beds, free Internet, coffee makers, complementary coffee and tea, and hair dryers. Visit the Crowne Plaza’s Starbucks Café and indoor pool with whirlpool. The lobby’s shopping concourse features a soda shop, Hershey’s Chocolate World and gift shop. Reach Casino Niagara via the sheltered walkway. Sheraton on the Falls: Comfortable accommodations and generous amenities at reasonable rates make this hotel ideal for various travelers. A block from the cascading wonders, its impressive height ensures magnificent sights. Enjoy plush Sheraton Signature Beds, Internet access, the lobby’s Starbucks Café and bar, outdoor and indoor pools, spa, and fitness center. Take the enclosed passageway from Sheraton on the Falls to Casino Niagara. Prime Steakhouse: Relish this contemporary eatery’s timeless Fallsview flair. Sample handcrafted cocktails, wines, and inspired entrees from steak to fresh seafood. The kitchen prepares memorable Prime Steakhouse servings to suit your taste perfectly. Massimo’s Italian Fallsview Restaurant: Try refreshingly modern dishes with classic Italian tastes while enjoying spectacular waterfalls and seasonal fireworks. Innovative fare combines Massimo Capra’s authentic recipes, locally sourced ingredients and fantastic wines. Fallsview Buffet: Feast on the Sheraton’s gourmet spread at any of its three daily meals. From wide-ranging options to live cooking stations, Fallsview Buffet’s variety pleases even picky eaters. Marvel at the dazzling sunrise above the falls over a tasty breakfast. Fireworks emblazon the dark sky during lovely romantic dinners. 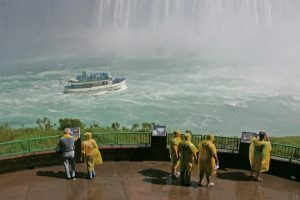 Any Niagara Falls vacation package and hotel you choose helps your travel dollars go farther. Staying in the action-packed tourist district lets you spend more hours having fun and less time getting to attractions and restaurants. Reserve your preferred deal today.